Sold by UnionBasic and Fulfilled by Amazon. Gift-wrap available. 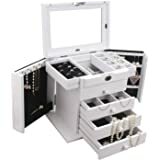 Vlando Faux Leather Jewelry Box Lockable Necklace Earrings Rings Storage Case with Mirror and Storage Drawers. 3. Second Tray: Total 4 large compartments to put some necklace or other jewelries and watches. Each size is 7.5 x 6 x 2.3 cm / 2.95 x 2.36 x 0.91 inch. 4. Third Tray: 3 compartments in the height of 5cm /1.97 inch. 1 big compartment of 16.5 x 13 cm / 6.5 x 5.12 inch with 1 more inner layer. 1 small compartment. 1 big compartment with 1 cushions special for watches. 5. Excellent layout design, attractive appearance, simple structure and fine workmanship. 6. The compact size, key lock and carrying handle make this jewelry case ideal for travel. 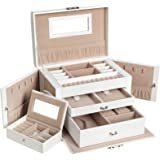 Lots of compartments and very good quality. I’m very happy with this item. 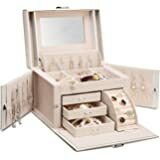 I purchased the Vlando Jewelry Box for a Mother's Day present. It arrived on time and I was well pleased with this product. The color is almost the color of cooked shrimp and very pretty and spacious. The person who received was very happy with it and very appreciative. She liked the handle on top and if traveling for the week-end she just pick-it-up and go. The box seems to constructed of quality materials and will take some everyday wear. I'm pleased with this purchase. 5.0 out of 5 starsBeautiful and exactly what I was looking for! 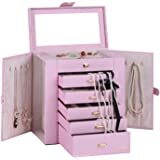 I bought 2 of this jewelry boxes for my daughters' 10th birthday and they loved it!! It has plenty of compartments to store their little treasures. Only one suggestion, I hope the last drawer could be a bit deeper so that there is enough room for different size wrist band or watch. Overall a great buy! 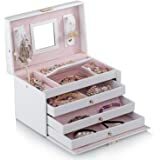 5.0 out of 5 starsPretty pink case is good for my smaller jewelry. 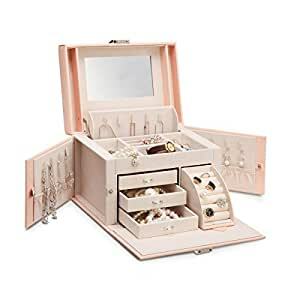 This compact jewelry case is very good in a number of ways. It keeps pendant necklaces free from tangling together with side door openings and pockets for the chains (the necklace hangs from its own hook). There's a ring holder area that will take lots of rings. 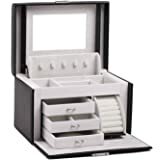 Three drawers can hold bracelets and pins or earrings. The top layer can take slightly larger baubles. Very nice for a gift. 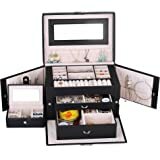 It is pretty large with Lots of compartments , it can hold a lot of jewelry, nice looking and easy to use. It also has a handle on top so you can transport it easily.Only complaint is the way it closes up and latches you have to fold it in and try to hold it closed to latch. Other than that it is great and I would recommend buying. I bought it as a gift and my daughter loved it and I ordered one for myself. 5.0 out of 5 starsNice for the purchase price.. Purchased this for my 11 y/o granddaughter for Christmas. It's an adorable, imitation croco-embossed carrying case/jewelry box. There is no key to lock it but rather snaps shut with a clasp. It has many, many fabric lined compartments and hooks and arrived with a thin dust bag covering it. I thought it was made fairly well for the price. I added a few trinkets inside and she lit up brighter than the tree.